Undo turn in A student decides to improve an assignment after they've turned it in before the due date. Return and Turn in again A teacher returns student work before the due date and requests an addition or revision, allowing the student to turn in the assignment again. Late turn-ins allowed Return work and allow students to turn in additions or revisions after the due date has passed. Checkboxes Return work and assess scores on a rolling basis rather than all at once. Analytics dashboard Track student engagement with an assignment as the counter updates with how many students have viewed the assignment's details or turned in their work. Navigate to the General channel under the desired classroom, then select Assignments. Tip: Search for any assignment by keyword in the search bar. Navigate to the assignment you'd like to review and select it. Then, select Review. Displays a counter of how many students in your class have viewed and turned in the assignment so far. Includes the number of assignments you have left to review. Each student's name has a checkbox next to it so you can choose individual students to return work to. The checkbox at the very top selects every students' name. Select the arrow to sort students in ascending or descending alphabetical order. Any documents you specified to be turned in are attached here. Select a student's status to view their work in full-screen mode. If the student's work is late and it's past the due date, you’ll see a Late notification. Students who have not turned in work will show as Not turned in. You'll see Returned if you've already returned the assignment to that student. 5. Select a box under Feedback to add comments for a student. 6. Add points if have designated points for this assignment. For example: 3.7/4.0 or 88/100. 7. Select the top checkbox to return work to all students or select the checkboxes next to individual student names. 8. Select Return. The students you selected will receive a notification that their assignment has been returned. When you've requested that students submit a revised assignment after you've returned it, revisit the assignment by opening it and selecting Review. You'll see an updated time and date stamp in the student's row. Repeat the steps above to update your feedback and return the assignment again. If you'd like to continue accepting turn-ins after the due date has passed, flip the Late turn-in allowed toggle to Yes. Flip it back to No when you're no longer accepting turn-ins for this assignment. 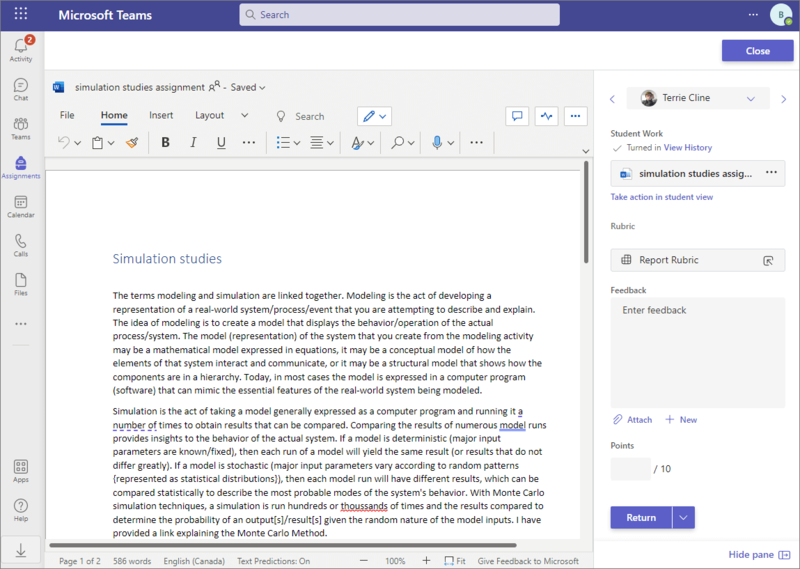 To review assignments in full-screen mode, select a student's status to open their work. Use the arrows to navigate from student to student. Feedback and and points you enter will be saved automatically. 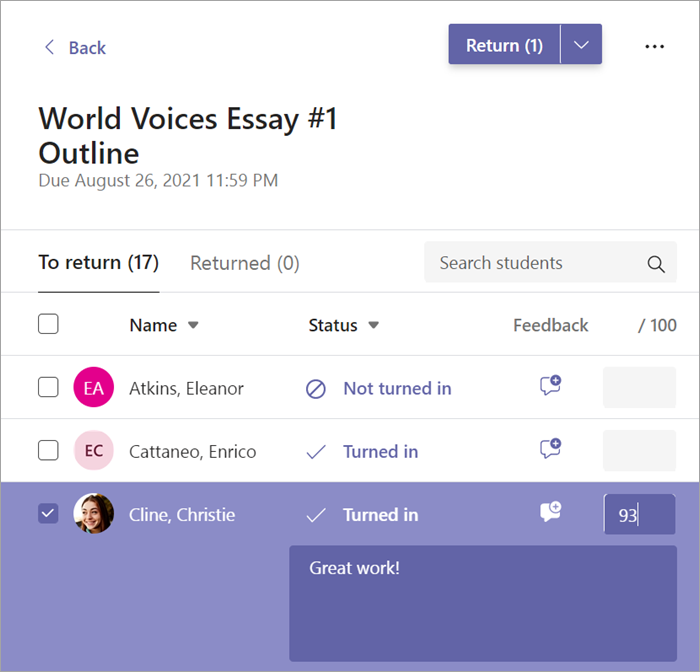 While in full-screen mode, open and view documents students have turned in using OneNote Online, Word Online, PowerPoint Online, or Excel Online. To turn in an assignment, select its assignment card. Depending on the status of your assignment, you may be turning your work in on time, late, or submitting revised work after it's been returned to you. Navigate to the General channel under the desired classroom, then select Assignments. You can also use your search bar to search for an assignment by keyword. Your assignments will show as cards organized by the date they are due. Select any assignment card to open it and view the assignment’s details. Tip: Select the Expansion icon (diagonal, double sided arrow) to work in full-screen mode. 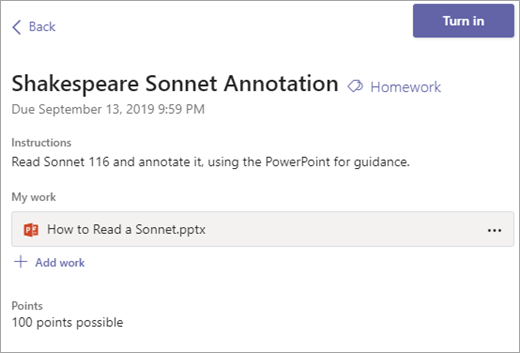 If your teacher specified a document for you to turn in or you have other files to attach to this assignment, select +Add and upload your file. It's possible to work on Office files right from this screen--no need to leave the app. If you're turning in the assignment for the first time before the due date, select Turn in. You'll see a time and date stamp recording your turn-in. Take back an assignment you've already turned in to make changes before the due date. Turn in work after making revisions to an assignment you've already turned in. For example: Your teacher has returned it to you and asked for changes, or you've decided to revise your work before the due date. Turn in work after the due date for the assignment has passed. This means your teacher is accepting late turn-ins. You might be turning in the assignment for the first time or submitting a revision after it's been returned to you. Your teacher is no longer accepting turn-ins for the assignment and you won't be able to turn in work.